Huge white blooms which open early and last longer than many other varieties. 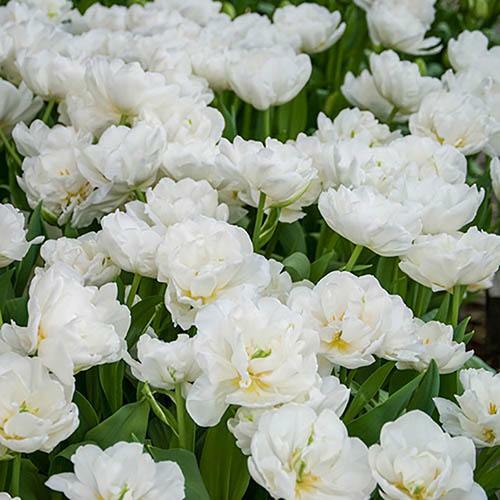 Also called a 'Peony Tulip' because of the striking resemblence to the double flowers of a peony, 'Mount Tacoma' has huge snow-white blooms which open from April and last longer than many other varieties. 'Mount Tacoma' also has a slight scent to it but what's best is the romantic cottage garden feel this variety can bring to your garden. Perfect for planting both into containers or staight into the ground with a mix of contrasting colours and varieties, such as 'Blue Diamond' or 'Double Pink', these peony tulips have a real romantic presence in the garden. Their blousy blooms are particularly effective as a cut flower as they are something quite different and unique - why not give a bunch as a gift to a friend or family member on a special day? Supplied as a pack of size 10/11 bulbs ready for planting.